Nonprofits are businesses organized for a purpose other than generating profit. For that reason, the survival of a nonprofit often depends on acquiring donations from the public. These organizations, however, must comply with state and federal laws that place certain restrictions on the solicitation and use of donated funds. Understanding how these rules affect your nonprofit can ensure the continued existence of the organization. If your nonprofit furthers a specific charitable, scientific, educational or religious purpose, you may apply for 501(c)(3) tax-exempt status from the federal government. In addition to your nonprofit being considered exempt from federal income taxes, 501(c)(3) status allows donors who contribute to your organization to take a deduction on their individual tax returns for amounts donated. This feature can create an incentive to donate. It also brings a sense of credibility to your organization, because detailed reporting and accounting of your business transactions must be provided annually to the Internal Revenue Service. However, certain substantiation rules apply to donors, and your nonprofit is required to provide written acknowledgement for any contribution made in excess of $250 to a donor upon request. It is not uncommon for a nonprofit to receive donations in forms other than cash; nonprofits also can receive "in kind" donations. An example might be the donation of a guitar to a nonprofit music camp. For in kind donations, the IRS requires that the donor obtain an appraisal on any asset donation claimed at more than $5,000. This rule provides for more accurate accounting of property owned by your nonprofit. The IRS also has special rules regarding quid pro quo donations. 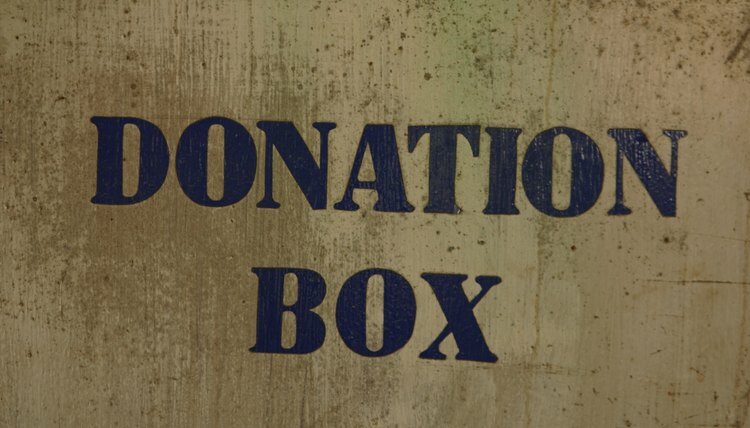 A quid pro quo donation is a charitable contribution in which the donor receives some good, typically of lesser value, in exchange for the contribution. An example would be if your nonprofit gave away stylized T-shirts valued at $20 to all donors who contribute $100. In this case, the donor would only be able to deduct the difference, or $80. For quid pro quo donations, you must provide a written disclosure statement for all donations over $75, regardless of the deduction amount that the donor can claim. Penalties can be imposed by the IRS for failure to follow the disclosure requirements. Although state and federal law requires that donations be used to further the purpose of your nonprofit and never paid out as dividends to directors or staff, donors are allowed to place additional restrictions on the use of their contributions. These are known as restricted donations and can be either temporarily or permanently restricted, as noted in the written gift instrument that accompanies the donation. Temporarily restricted donations can be either time-restricted or purpose-restricted. Examples of temporarily restricted donations would be a contribution of $50,000 to cover your nonprofit's operating budget for 3 years, or to fund the building of an in-house library. Once the time period passes or the purpose is achieved, the funds become unrestricted and can be used for any purpose consistent with your mission. By contrast, permanent restrictions typically utilize interest earned on the donation to provide support indefinitely. An example might be a donation of $500,000 to a summer camp, with the annual interest to be used to provide scholarships to low-income children. Fundraising events can be an effective way for your nonprofit to solicit funds. However, some states impose registration requirements for organizations wishing to hold charitable events. In Michigan, for example, most nonprofits must register with the attorney general before the event and also must provide certain financial disclosures. In states that do not require advance reporting, registration may be required if you will be utilizing the services of a professional fundraiser. What Is a In-Kind Donation 501C3? A 501(c)(3), or non-profit, is an IRS approved organization that has a charitable, religious, public safety, or educational purpose. The benefit of qualifying as a nonprofit is that the organization does not have to pay taxes on the money it receives and donors to a 501(c)(3) can deduct the amount of their gifts from their taxable income. As a result, classifying and measuring the amount of donations, such as in-kind donations, can be an incredibly important part of preparing an entity’s tax return. Encouraging donations is an important part of ensuring the success of a non-profit organization. In order to avoid penalties from the Internal Revenue Service and maintain exempt status, IRS requirements must be met and can vary based on the type of gift and its value. These requirements may include a written acknowledgement from the non-profit and an appraisal of the item. In addition, special rules apply if goods or services were received from the nonprofit in exchange for the donation or if the donee gifts automobiles, planes or boats. Are Nonprofit Raffle Ticket Donations Tax Deductible? For the purpose of determining your personal federal income tax, the cost of a raffle ticket is not deductible as a charitable contribution. It may be deductible as a gambling loss, but only up to the amount of any gambling winnings from that tax year. If you donate property to be used as the raffle prize itself, its value may be deductible as a charitable contribution. How do I Accept Donations on a Pending 501(c)(3)?